Niagara Falls is one of the most dramatic waterfalls in the world. The three waterfalls that makeup Niagara, Horseshoe Falls, American Falls, and Bridal Veil Falls, have a combined flow of 150,000 gallons (567,811 liters) of water per minute, the highest flow rate of any waterfall in the world. 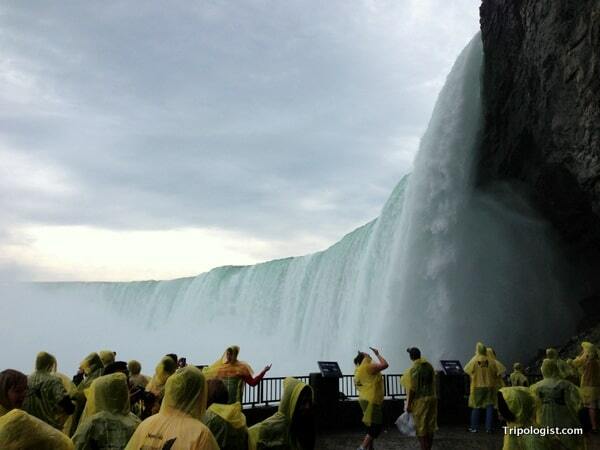 For many people, visiting Niagara Falls is on their bucket list and for good reason: the falls are simply amazing! During my first visit to the falls several months ago, I had the opportunity to experience the majesty of Niagara Falls in several different ways and in two different countries. 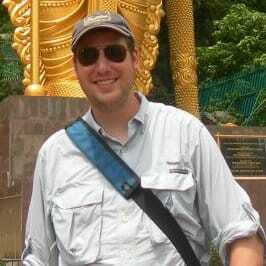 And, while the American side may be more peaceful and relaxing, the views from Canada are far superior. Here’s my list of the five best ways to experience Niagara Falls from the Canadian side of the border. Operating since 1846, the most legendary way to see Niagara Falls is with a ride on the Maid of the Mist. The 30-minute ride aboard one of the ships gives you the opportunity to get up close to all three of the waterfalls that make up Niagara Falls. 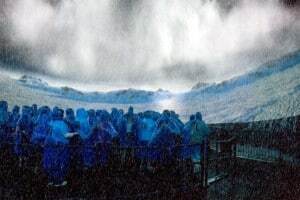 On the ride, you are so close to the falls that you’ll feel the spray and appreciate the blue poncho each visitor is given. While the views from the Mist are amazing, taking a non-waterproof camera is definitely not recommended. 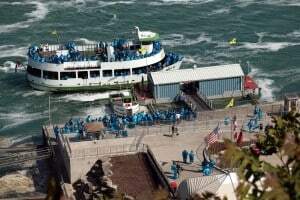 Starting in 2014, the Maid of the Mist will only be operating from the American side of the Falls as a new company has taken over the contract on the Canadian side. Fortunately, if you really want to take the Maid of the Mist, you can walk across the border (assuming you have your passport and don’t mind going through immigration controls). 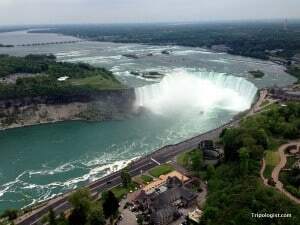 The view of Horseshoe Falls from the top of Skylon Tower. You can’t miss Skylon Tower when visiting Niagara. Standing nearly 800 feet above the base of the falls, the tower is ugly as sin, but it makes up for it with one of the best views of the falls far below. Hopping on the futuristic yellow elevators that quickly take you to the tower’s observation deck is an awesome experience. The view from the top of Skylon Tower is spectacular. Looking down on Niagara Falls so far below you gives you a unique vantage point on the rushing water underneath you. Looking away from the falls, you can see both Toronto and Buffalo, New York on a clear day. The view of Horseshoe Falls at Niagara Falls from the platform of “Behind the Falls”. The ironic thing about Journey Behind the Falls is that actually going behind the falls isn’t the reason to do this attraction. Instead, the reason to do Journey Behind the Falls is so that you can access the best viewing platform in the area. Sitting just to the right at the base of Horseshoe Falls, the Journey Behind the Falls viewing platform offers visitors a chance to feel the mist from dry land. It’s also a great place to get pictures as you can stay relatively dry if the wind is blowing the right way. 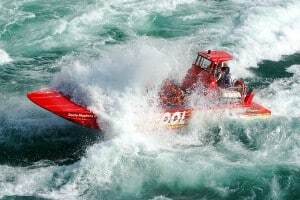 A Whirlpool Jet Boat splashes through class-5 rapids on the Niagara River (Image used courtesy of Whirlpool Jet Boats). I’ve already written an article about my experiences on the Whirlpool Jet Boat at Niagara Falls, but I had to include it here as well because it’s such an awesome way to experience Niagara. Despite not seeing the waterfalls on the boat tour, you’ll still experience how amazing they are by traveling through the canyon the waterfall created and flying through some class-5 rapids downstream from Niagara Falls on the Niagara River. I highly recommend the Whirlpool Jet Boats! Described in the Niagara brochure as a “Universal-style attraction”, Niagara’s Fury is a thrilling 4-D experience that wouldn’t feel out of place in the next “Ice Age” movie. Standing in the middle of a 360-degree theater, you’ll learn about how Niagara Falls was created, all while the floor below you moves and water sprays at you from every direction. While this is a fun attraction for adults, I would highly recommend it for kids! Find somewhere great to stay on the Canadian side and the US side of Niagara Falls. 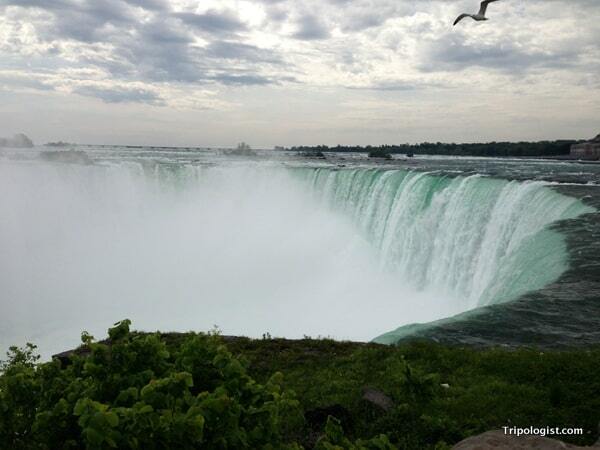 My trip to Niagara Falls was sponsored by Tourism Ontario and the Niagara Parks Commission. 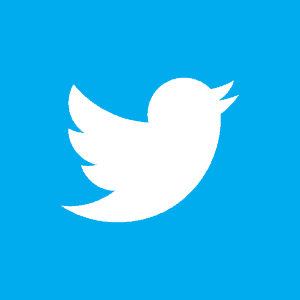 As always, the opinions expressed are my own.